Jake Gyllenhaal makes a startling impression in Nightcrawler, an electrifying and nerve-wracking thriller from writer and director Dan Gilroy. Louis (Gyllenhaal), a skeletal, yet sharp-witted victim of the recession, inadvertently stumbles into the competitive world of night crawling. 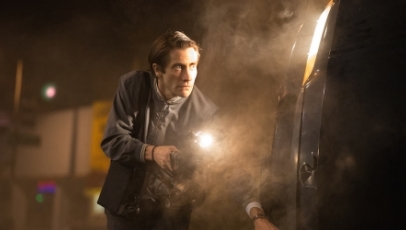 Armed with a video camera and police radio, Louis proceeds to capture pervasive footage of crime scenes, swiftly selling it off to news stations together with his soul.Centred around Gyllenhaal’s full-bodied performance, Nightcrawler is an exceptionally executed, pitch-black satire of 24/7 television news. No stone is left unturned in Louis’ efforts to win success and impress Nina (Rene Russo), a nightshift news editor of equally dubious morality, and Gilroy’s narrative further ensnares with every twist and turn. The cinematography from Robert Elswit is uniformly excellent; the sleek streets of LA breached by death and unethical behaviour. It all adds up to a film that’s compelling and forceful, with a psychological underside that shocks with its veracity.